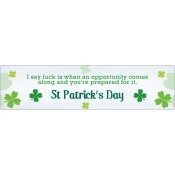 St Patrick’s Day magnets are perfect for wishing your Irish friends, clients, and untapped customer segment during the St Patrick’s Day. These promotional magnets are unique and they reflect the respect towards the rich cultural heritage of Ireland. Full -color seasonal magnets are retained over the fridge doors and perceived with the high respect! We offer free ground UPS shipping within the Contiguous USA. Avail largest wholesale savings ever offered by any other internet store! 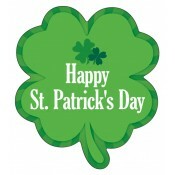 St Patrick’s Day, also popular as the Feast of Saint Patrick is a religious celebration for Irish Catholic community residing in USA and Canada. 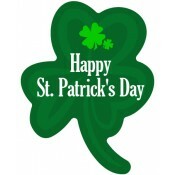 Every year this festival is observed on the March 17, coinciding the death date of most beloved Saint Patrick of Ireland. Shamrocks are the popular symbol of the festival. The Irish community around US mark the occasion by attending church services, dancing on the streets accompanied with traditional Irish music, attending Ceilidh and organizing a lavish parade express their culture. However, the tradition of holiday gifting is slowly catching up with Irish community. It is observed that most Irish are keen to splurge on thoughtful gifts such as these full-color magnets, which embody true Irish spirit and lasts longer. 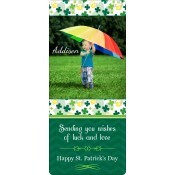 Our selection of St Patrick’s Day refrigerator magnets embody spirit of Irish celebrations and it is perfect to acknowledge your Irish friends or clients who contribute to your business. 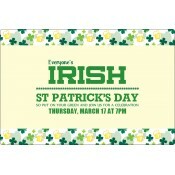 Do you know 11% of the American population claims Irish ancestry? Whoa, a big customer segment, isn’t it? 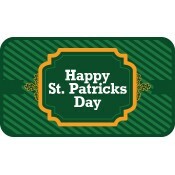 If you wish to impress this customer segment with persuasive advertisements, rather than intrusive ones, feel free to stick with these St Patrick’s Day fridge magnets. 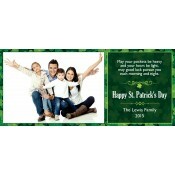 These customized festive magnets are perfect for gifting during tradeshows or they make an impressive complementary gift with St Patrick’s Day purchases. 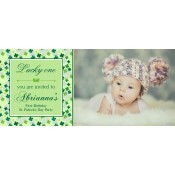 You can find impressive shamrock shaped magnets and personalized celebratory magnets in our collection. 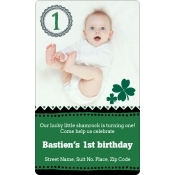 In addition, we encourage marketers to try it over oval magnets, circle magnets, other Irish symbol custom shaped magnets, and custom die cut magnets. If you wish to seek uniquely shaped magnets crafted over popular Irish symbols, we can help you with custom die cut magnets. We offer free art setup, free online design proof, free shipping, and free full color printing with all our custom seasonal magnets and other promotional magnets. Additionally, we offer exciting festive savings to marketers, who wish to order these customized magnets for distribution or bulk mailer. To know more about customization, shipping, distribution and more, feel free to contact us at 855-762-4638 or write to us at info@cmagnets.com.